Earlier this week, while reading old entries of a blog I’m newly obsessed with (Cupcakes and Cashmere) I came across a recipe which the blogger had actually found in another blog I really like (Smitten Kitchen) where that blogger had adapted it from Gourmet magazine (ahh, the power of the interwebs): pumpkin freakin’ bread pudding. Mind. Blown. 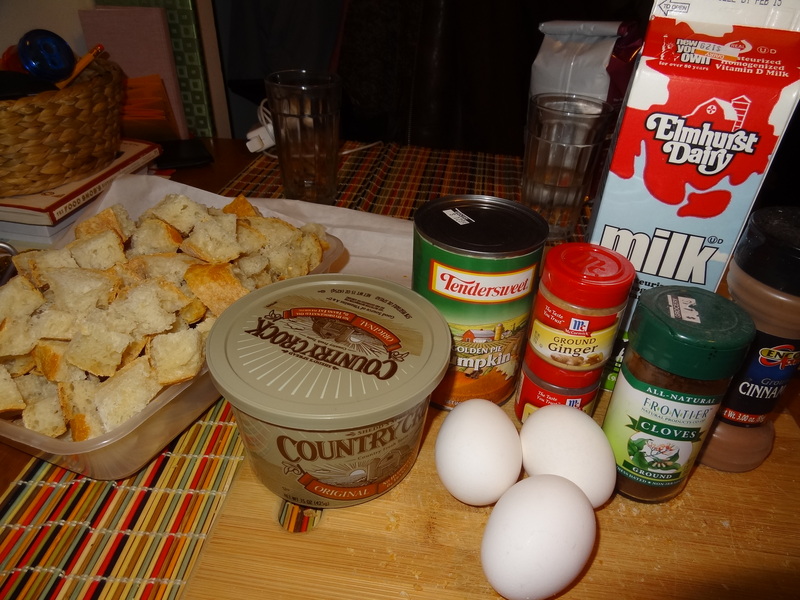 I put the butter and the bread aside and threw everything else (in their appropriate quantities, duh) into a bowl. 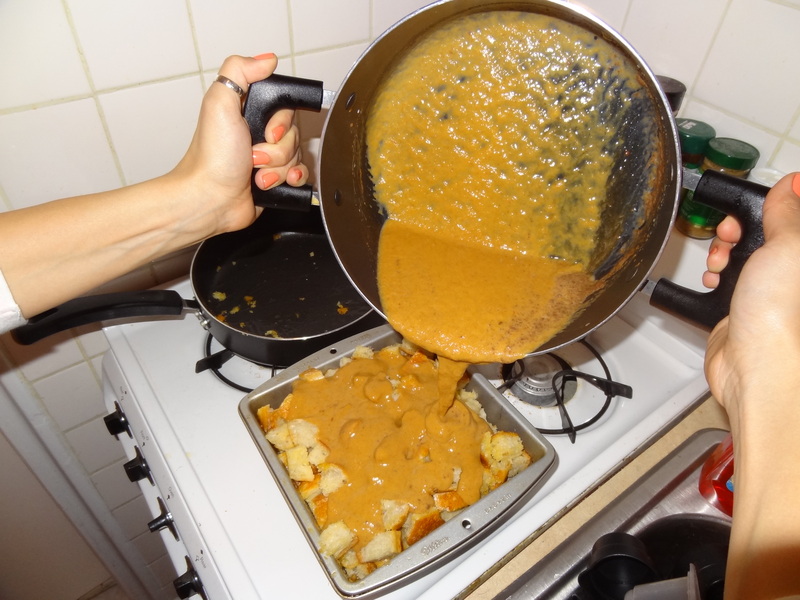 But because I’m ever the rookie in the kitchen, I used a bowl that wasn’t big enough for me to whisk it all together without making a huge goopy mess, and ended up having to pour it into a big pot. Unnecessary steps are always part of the experience for me. After melting the butter and coating the bread in it (a very hands-on step, by the way), I filled a square baking pan with the now slightly soggy, buttery bread. 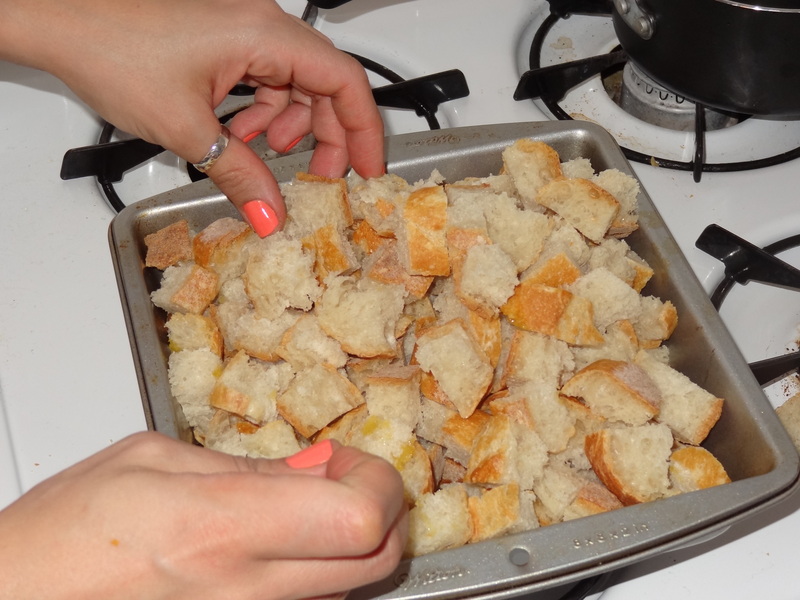 I will fully admit several pieces of bread never made it into the final version because I ate them along the way. Warm, buttery bread cubes are hard to resist. 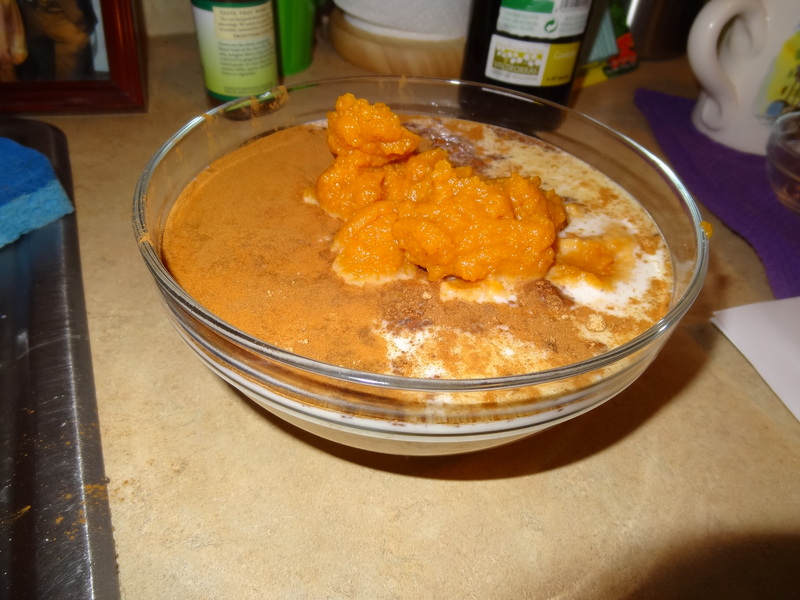 Next, I took the pumpkin-milk-eggs-spices mixture, which had been whisked together into a velvety, gold, sweet smelling cream, and I poured it over the bread cubes, using a spoon to make sure it seeped into all the corners and edges. Nothing like a little creamy pumpkin bath. I wish the technology existed for you to be able to smell this. 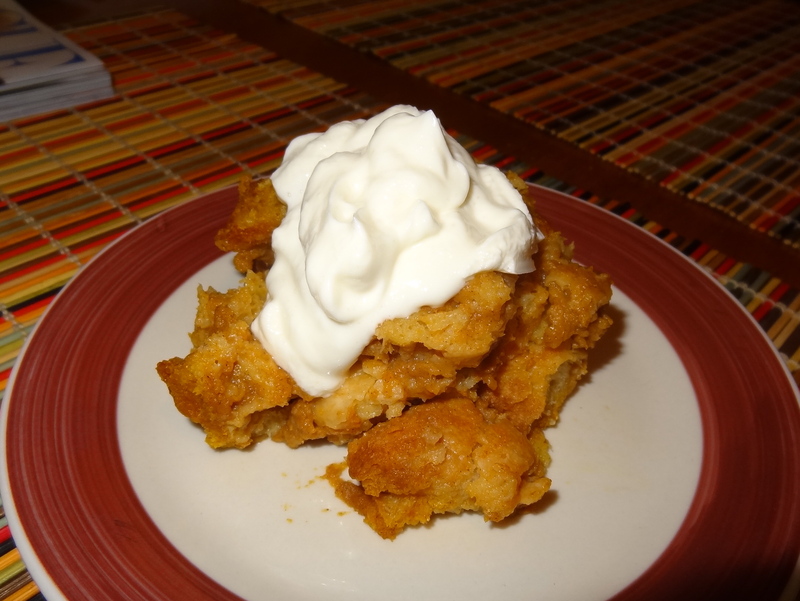 While a scoop of vanilla or butter pecan ice cream would have been great, I took Smitten Kitchen’s recommendation and topped my chunk of pumpkin bread pudding with a generous dollop of vanilla greek yogurt. With its subtle sweetness and sour tang, the cool yogurt was a nice contrast to the warm, soft creaminess of the bread pudding. Not to toot my own horn, but I’m going to: this was a damn good bread pudding! Maybe there’s hope for me yet! And voila! 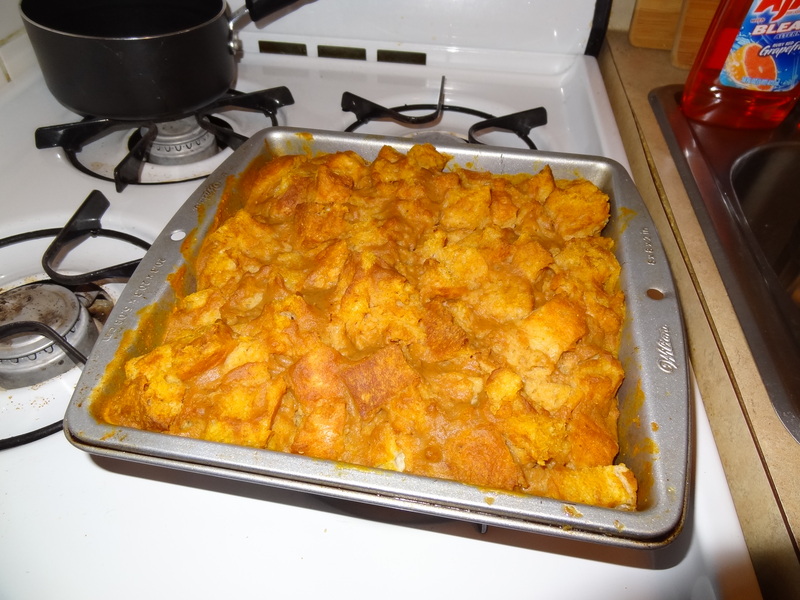 Pumpkin bread pudding!